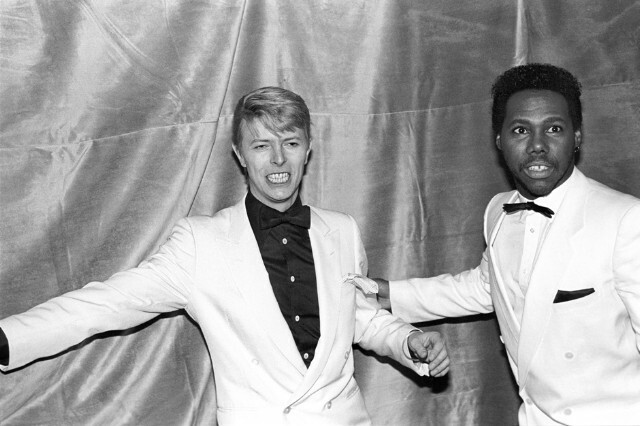 Nile Rodgers, Chic frontman and veteran disco guitarist, was also a friend and frequent collaborator of David Bowie’s. Together, the two worked on 1983’s indelible pop smash Let’s Dance (Bowie’s best-selling record to date), and 1993’s jazz-inspired Black Tie White Noise. In the hours following Bowie’s death, Rogers spoke to a number of media outlets (Pitchfork, EW, the New York Post, the Guardian) to praise his friend. Here are a collection of quotes from each discussion. I had always idolized and respected [Bowie], and we first met in the early ’80s at an afterhours club, where we talked for a while. Then we met at his Manhattan apartment, where he showed me a picture of Little Richard in a red Cadillac and said, “I want my album to sound like this.” He just had to show me a picture, and I completely understood. He wanted something that felt like the future but was rooted in rock‘n’roll, something soulful, black, and R&B, but morphed and evergreen. And that’s what Let’s Dance is. I’ve always called [Bowie] ‘the Picasso of rock & roll. It always embarrasses him, but I say it to his face in public, anytime we’re with people. He was so enamored with jazz artists, from eclectic, avant garde to art-jazz artists to even what we’d call corny: very straight-ahead, Stan Getz and people like that. David loved it and appreciated it. The main reason why, he explained to me, was in those days, on the BBC, they just played everything; they didn’t categorize it Blues, Rock, or Soul, or whatever. So David grew up with this incredibly open mind. From the moment we started speaking, we never stopped talking to each other; he and I, it was as if we were in a bubble and no one else existed. It was probably the most significant few hours of both of our careers, especially if you talk in terms of what was to come: the numbers, the units sold, and the influence. I know many people in the world who only have one David Bowie album, and it’s Let’s Dance.